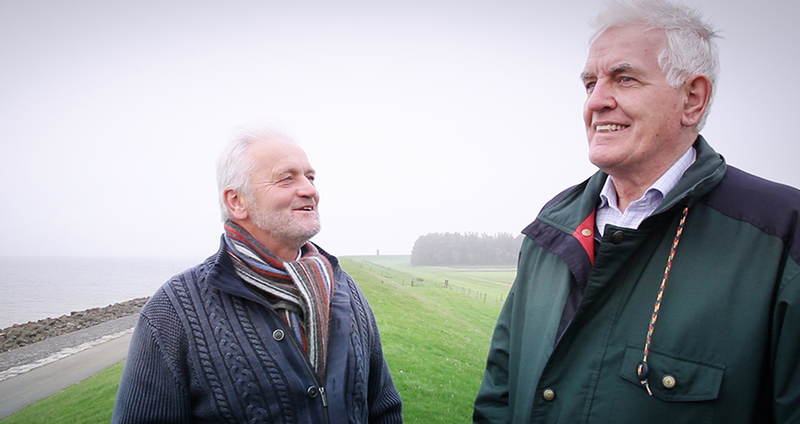 For over twenty years, farmers Tjitte de Groot and Pieter Meulendijks worked on their dream. In addition to agricultural entrepreneurs, they became wind entrepreneurs. Their activities started small: one turbine in their own farmyard. In the 1990’s, the municipality decided to give entrepreneurs the opportunity for a linear arrangement of turbines along the dikes, but not for a turbine in each yard. From 1996, Tjitte en Pieter started scaling up with Westermeerwind Wind Farm: a linear arrangement of turbines in the water of the IJsselmeer, along the dikes of the Noordoostpolder. Many administrative, technical, political, environmental and societal obstacles had to be overcome, often together with neighbouring wind farms in the Noordoostpolder Wind Farm. In June 2013, all the lights finally turn green. The construction of Westermeerwind Wind Farm began in 2015. In the spring of 2016, the 48 turbines will generate enough sustainable energy for about 160,000 households. These are all the households of the entire Flevopolder province.